Retiring a sweater number is one of hockey’s highest honors, reserved for the best of the best and for players who impacted a city both on-and-off the ice. Three banners hang from the rafters of General Motors Centre in Oshawa, Ontario; one belongs to eight-time Norris winner and two-time scoring champion Bobby Orr, another to 1995 MVP Eric Lindros and a third to Red Tilson, who lends his name to the trophy for the OHL’s Most Outstanding Player. Orr’s (junior) number two, Lindros’ 88 and Tilson’s nine will never be worn by another Oshawa General. John Tavares becomes the youngest player in Oshawa Generals history to have his jersey retired. 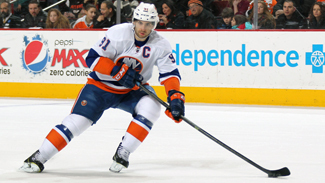 Tavares is the Generals all-time leading goal scorer with 183 goals in 223 games. On Sept. 28, a fourth banner will be raised, this one inscribed with the number “91.” Islanders captain John Tavares will be honored in a pregame ceremony, as his number is officially retired by his junior club. Tavares was humbled by the honor, but it’s well-deserved. The Islanders captain was granted “exceptional player” status (now nicknamed the “John Tavares rule”) allowing him to play for the Generals as a 15-year-old. The young Tavares took the league by storm, scoring 383 points (183G, 200A) in 223 games with the Generals. Tavares made history while wearing the Generals crest, becoming the team’s all-time leading goal scorer and finishing second on the all-time points list. Had Tavares not been traded to the London Knights in his final season with the team – where he scored 50 points in 24 games for the Knights – he likely would have also claimed the all-time points lead. At 15, Tavares was the youngest player in the league and had to deal with added media scrutiny in addition to the prerequisite chaos of uprooting oneself from home and playing a demanding OHL schedule. It started a path that led him to being an Islander and set him up for his future success, but those were also formative years for Tavares as a person. Tavares still attends charity events and keeps in touch with former coaches, his billet family and other members of the Generals organization. When he was traded from the Generals in 2009, he told the Canadian Press that his heart would always be in Oshawa. His heart and, now, his sweater too.